I had recently plotted the position of this comet on my star atlas with the intention of tracking it down on the next good clear night. The early morning hours of October 29/30th 2008 provided me with an excellent clear sky so I set the 8.5" F/7 reflector up at a strategic corner of the garden to avoid the glare of street lights and let it adjust to the cool temp. The ground was soft and soaking due to thawing snow which had been ongoing for the previous two days. C/2006 OF2 Broughtan was located in Lynx. At this time of the morning the comet was perfectly placed at the zenith. After observing a few DSOs and admiring the ghostly green glow of the Gegenschein I felt my eyes were ready for comet seeking. I began a slow search through Lynx at the comet's location and found it very quickly at 03.21 UT. It looked like a small hazy spot with a bright stellar central condensation. The coma was well condensed. It reminded me a little of C/2006 W3 Christensen. The coma was best seen with averted vision. I suspected a faint tail extending to the N but I couldn't confirm it. I made this sketch at the eyepiece. The true field had many more stars. 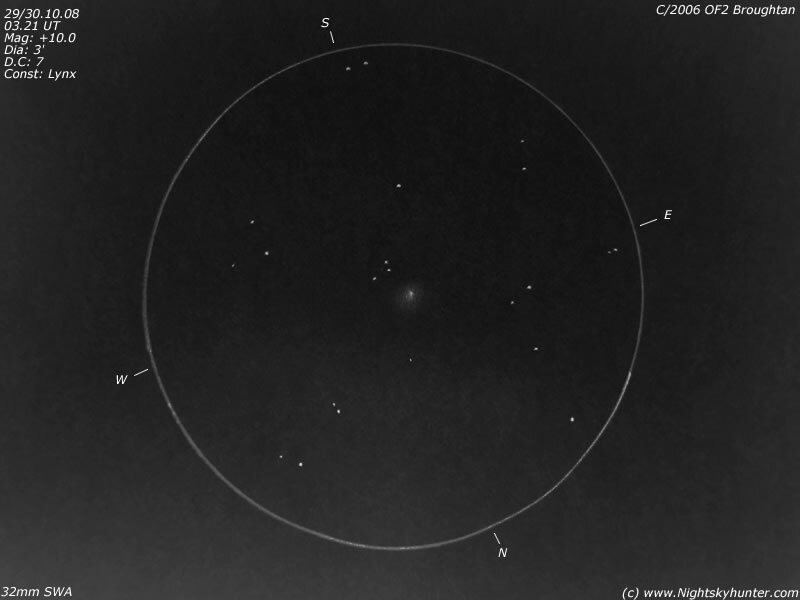 I estimated the comet at Mag +10.0, Dia: 3' and a D.C of 7 due to its condensed profile. This is my 45th observed comet.